Ernie Anderson '37, who served Augsburg College as its men's basketball coach for 23 seasons and as its athletic director for 34 years, died on Sunday evening. He was 90 years old. 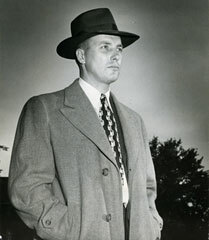 Anderson served as men's basketball coach for the Auggies from 1947-70, and as the school's athletic director from 1947-80. He was inducted into the college's Athletic Hall of Fame in 1975. Funeral services for Anderson will be held on Friday, March 23, 2007, at St. Stephen Lutheran Church in Bloomington, Minn. (For a map to the church click here). Visitation will be at 10 a.m., with the memorial service at 11 a.m. Private interment will be at the Fort Snelling National Cemetery. To read more on Anderson click here. To read the Star Tribune obituary click here.